Developer Cyrus Vaughn presented a new site plan for the development on the former South Regal Lumber site (now being called Regal Commons) to the Southgate Neighborhood Council meeting on January 13th. The revised site plan and renderings still show a 30,000 sqft. “grocery” store as the largest building on the site. The new renderings also show a multi-story office building on the NE corner of the site as well as two drive-thru restaurants on the corners along Regal Street. 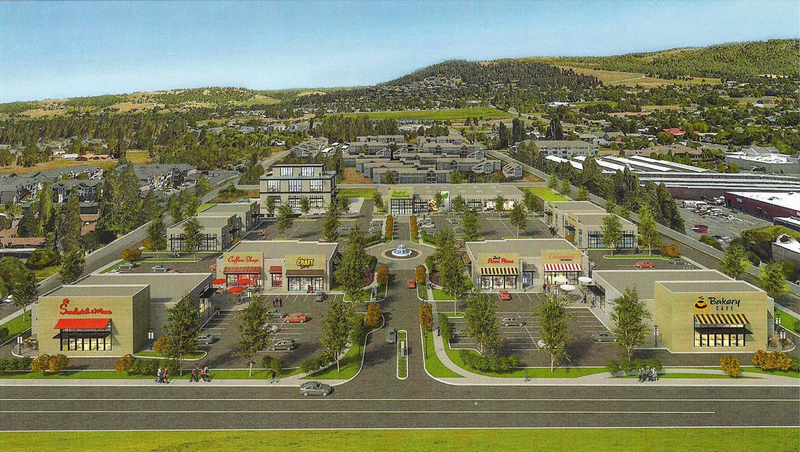 Rendering of proposed development looking east from Regal Street towards Brown’s Mountain. The developers provided a packet of information to attendees with these renderings and an email from the Spokane City Planning Department. Questions from the audience centered mostly on traffic impacts of the project, the lack of pedestrian orientation of the buildings along Regal Street and of the project overall given the 12 apartment communities within a quarter mile of the site. 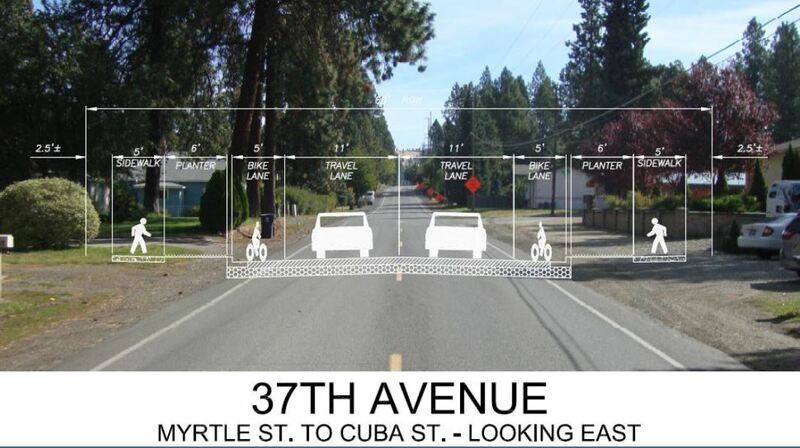 Additional comments were also given about the proposed traffic light at 53rd Ave and how it may be more appropriate to have that located at 55th Avenue since it is a through street running from Palouse Hwy. clear to Crestline St. The developers didn’t have any direct answers to these questions, but instead said these were things that would be studied and considered as the developers went through the SEPA and building permit processes after the annexation. As we mentioned in the previous post on this topic, the zoning given to the site in the annexation process will have ramifications on whether or not this development is more auto or pedestrian oriented. Another view of the proposed development looking NE. 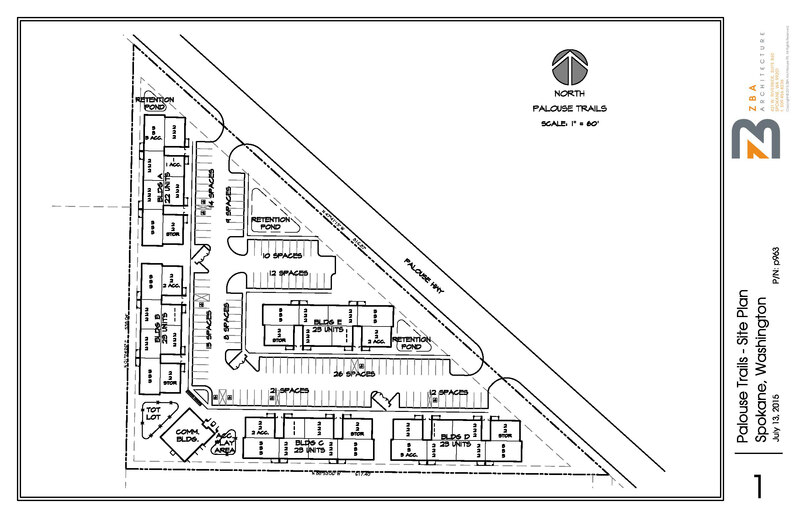 The revised site plan produced by project architect Nystrom Olson. On Friday, the City released the hearing schedule for the annexation proposal that will bring this property into the city. There will be two presentations to the City Council in briefing sessions: Monday, January 25th at 3:30pm in City Council Chambers and Thursday, January 28th at 3:30pm in the Council Briefing Center. The public can attend these events, but not public comments will be taken. Public comment can be given on Monday, February 8th at the City Council Meeting at 6pm in the City Council Chambers when the Council considers a resolution to set the final hearing date. That final hearing date is tentatively set for Monday, March 14th at the City Council meeting. If you have thoughts about the development and the proposed zoning of the annexed land, I encourage you to contact your City Council members by phone or email or come down and give testimony and comments at the hearings on February 8th or March 14th. 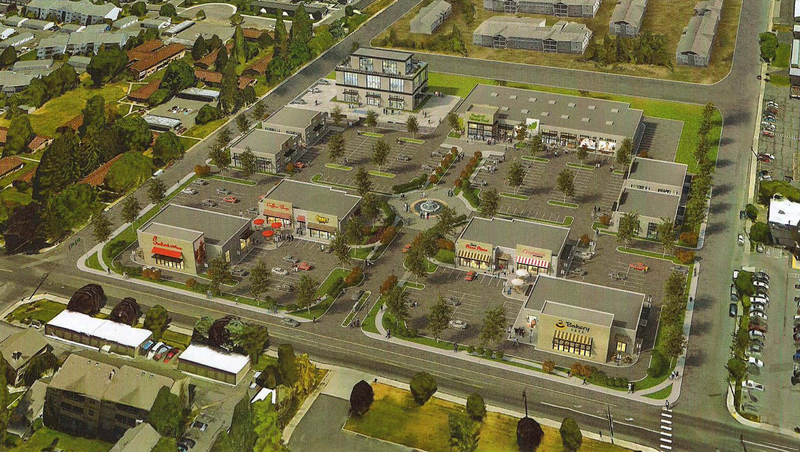 8-acre Retail/Commercial Property Planned on Former South Regal Lumber Site. Developers to present plans to Neighborhood Council on January 13th. Through the summer the neighborhood could hear the sound of jackhammers and rock crushers processing over 40,000 cubic yards of basalt and bedrock to level the former South Regal Lumber site for future commercial development. South Regal Lumber shut its doors at the end of 2014 and demolition and grading of the 8-acre parcel began in earnest last spring. The developers are now planning to move on to the construction phase of the project starting in 2016. In 2013 Cyrus Vaughn consolidated the ownership of the parcels along Regal Street between 53rd and 55th Ave. and successfully petitioned the County for zoning changes to allow commercial development of the entire 8-acre area. The new proposed development, Regal Commons, has been marketed to potential tenants and businesses for over a year by local broker Sperry Van Ness Cornerstone. 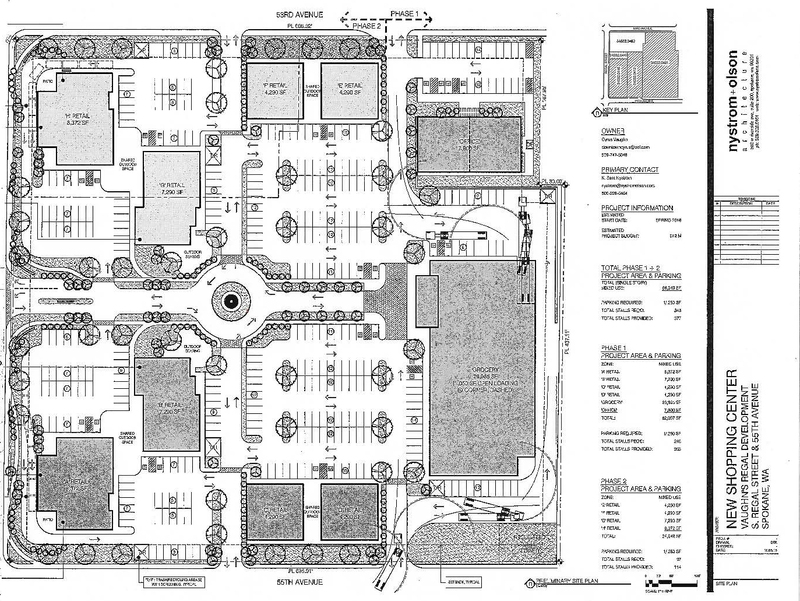 Their website shows renderings of the potential development and highlights such features as “12 Apartment communities within a quarter mile” and “Lighted Intersection at 53rd & Regal with 26,000 cars per day.” Potential tenants are listed as grocery, drug or hardware stores; restaurants, coffee shops and offices are also listed. 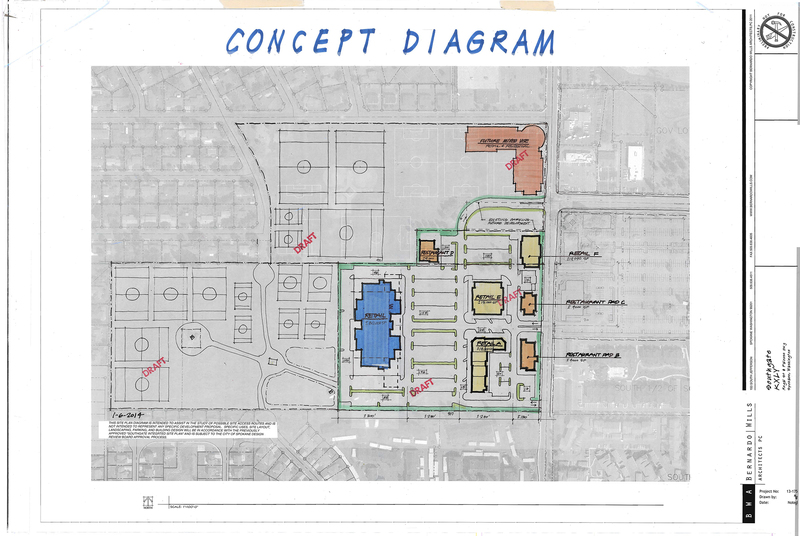 A plan view of Regal Commons from SVG cornerstone’s website. Regal Street is on the left. Main tenant is identified as a 25,000 sqft. grocery store. Elevation and detail view renderings of the proposed Regal Commons site as designed by local architects Nystrom-Olson. In June 2015 Byrd was again quoted by the Journal of Business regarding development on South Regal, this time specifically related to specialty grocery stores like Natural Grocers and Whole Foods. From the article: “I think you’ll see these types of grocers on Regal,” he says. “The South Hill has a good demographic for their users. That’s where people with higher socioeconomic income are concentrated.” The article discussed the new Trader Joes and Natural Grocers stores along North Division and discussed the entry of the last major brand in category, Whole Foods, into the Spokane market. With the economy improving, the eyes of the local commercial and high-density residential developers are falling squarely on our neighborhood. 2016 is shaping up to be a very busy year with KXLY, Regal Commons, and the Palouse Trails Apartments in various stages of development. In March of 2015, the Spokane City Council accepted the request of Spokane Housing Ventures to be annex their three apartment complexes along 55th Ave into the city. The Council, following city policy, expanded the annexation area to include adjacent properties to avoid creating a spot annexation surrounded on three side by County land. 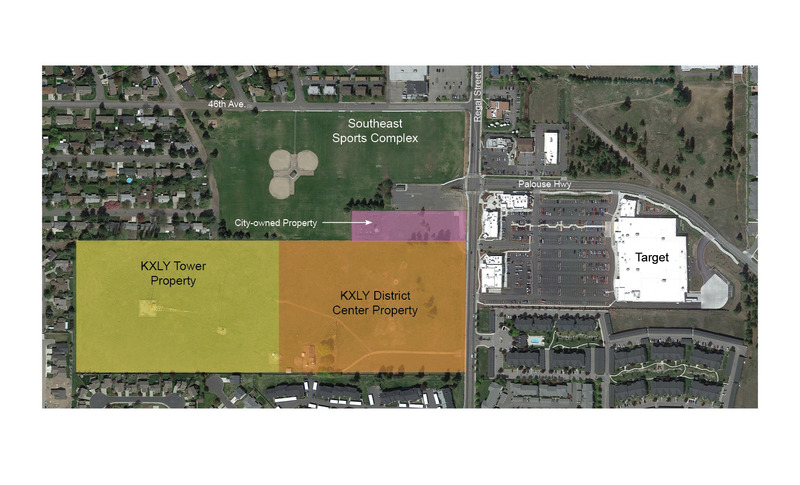 In December, the Spokane Plan Commission held its second workshop on the proposed annexation of this property and other adjacent parcels between 53rd and 55th Ave. from Regal Street to Palouse Hwy. Under consideration was the zoning designation of the parcel as it is brought into the city. Currently the property is zoned “Mixed-Use” under the County, the city of Spokane is considering either Community Business or Center and Corridor (CC2) for this property. Southgate Neighborhood Council provided comments and testimony at the hearing in support of the CC2 designation since it more closely aligns with the intent of the County Mixed-Use zoning and the goals of the Spokane Comprehensive Plan and Southgate Neighborhood Connectivity Plan. As noted by the developer, there are 12 apartment complexes within a quarter mile of this property (including 360 new apartments along 55th Ave. alone). The proximity of such high density housing makes this property a perfect candidate for a pedestrian-oriented mixed-use development that can provide services and amenities to the thousands of residents within walking distance. The City Council will be considering approval of the annexation in late January/early February, so there are opportunities for Southgate to provide more input to our representatives while they make their decision. The developers of Regal Commons are currently opposed to the Center and Corridor zoning designation, but they are coming to the Southgate Neighborhood Council meeting on Wednesday, January 13th to present their current plans and discuss them with the neighborhood. I strongly encourage area residents to attend the meeting to learn more about the future of this major commercial project and provide their input directly to the developers. A consistent, open dialogue is the best way for all parties to support each other and the smart growth of our neighborhood. Check our Minutes and Agendas page for the minutes of the December meeting for your review and the agenda for our January meeting. See you next Wednesday at ESD 101! Check our Minutes and Agendas page for the minutes of the September meeting (we had no SNC meeting in October) for your review and the agenda for our November meeting. REMINDER: This month’s meeting will be at Moran Prairie Library at 6004 S. Regal Street. Last Thursday the City of Spokane Engineering Department held an open house at Chase Middle School to discuss the upcoming 37th Avenue Rehabilitation and Water Main Project. Starting in April 2016, the city will install a 36″ water main from Regal Street to Havana Street, repave the entire length of 37th, add sidewalks and bike lanes to both sides of the road. The project also includes improvement of stormwater management from the Hazel’s Creek area the city-owned empty lot at Rebecca and 37th (see rendering above). The city has started a blog for this project where you can see all the details and leave comments for the city. You can also send your comments to Julie Happy at the city. There is a new 114-unit apartment complex being proposed for Southgate and the SEPA comment period is open till Wednesday, September 23rd. The Palouse Trails Apartments are designated low-income housing with all the units being available for people making 50% the local median income. It is being developed by Whitewater Creek, the same group that is developing the 360 apartment units on 55th Avenue. It is projected that this project will generate 758 new trips on Palouse Hwy. with 60% headed toward Regal Street and 40% going towards Freya Ave. The SNC Land Use Committee submitted comments related to project connectivity and possible impacts to the Palouse Hwy. Crosswalk project that will connect Copper Hill and Clareview to the Target site. The developers responded to our comments by saying they will continue the 12′ wide bike/pedestrian trail that runs along the north side of the Target site for the full length of their project’s frontage. I encourage neighbors to look at the project’s SEPA application and site plan (see above) and submit their own comments to the city. Comments can be sent to John Halsey at the City of Spokane at jhalsey@spokanecity.org. If you have any questions, please leave a comment and we will try to address them.